Whether you are a first time homeowner or just looking for a change, choosing your perfect color palette can be a challenge and one of the biggest challenges can be creating a color flow from room to room. Your color choices should reflect your style and personality. Do bright and bold colors make you happiest, or are you feeling the most comfortable when surrounded by neutral tones? Here’s the best part – there are no “correct” palettes when it comes to choosing paint colors, only guidelines to help you find what works best for you. We’ve put together some tips to help you choose what works best for your home. Using a consistent paint color on the walls of connecting spaces is a great way to get a cohesive flow throughout the home. This is especially true for a home with an open floor plan. This color can be your main neutral tone. Now, how to choose the paint color you really want? Start by picking a color for the biggest, most centrally located room. This will most likely be your living room or kitchen, and it’s a great place to start working on your whole-house palette. Pay attention to sight lines. If your living room is the central room, stand in the middle and take a look at all the other rooms you will see. The color for these spaces will need to work well together. One way to increase the likelihood that a color scheme flows from room to room is to limit yourself to colors in the same temperature family. This will depend on your style. Warmer colors would include reds, oranges and yellows, while cooler colors are the blues, grays and greens. Another option, would be to select one or two colors and then use variations of them. If the main color is blue, you could go with a gray-blue, a pure blue and a navy paint as you move from room to room. This same idea can be used when selecting your accessories. If you are going to go wild, it’s best to stick to rooms that aren’t visible from your main room or that are out of your sight line. Kids rooms, bedrooms and bathrooms can be great places to use bolder colors that are different from your main color scheme. Go ahead and indulge! If you still want to go bold in your main rooms – try using bold colored accessories to ad pops of color and to show off your unique style. Accessories are much less expensive and easier to move around then your furniture. Sixty percent of the room’s color comes from the walls – giving the room a unifying look, thirty percent is from the upholstery, providing visual interest and ten percent of the room’s color should come from accessories, adding that extra pop and sparkle to the space. The 60-30-10 rule can make choosing your colors easy and also help in achieving balance. To help you choose the three colors for your space, use a color wheel or you can even pull the colors from a fabric print because the fabric designer has already done the matching for you. Check out our blog with more information on the 60-30-10 rule here. 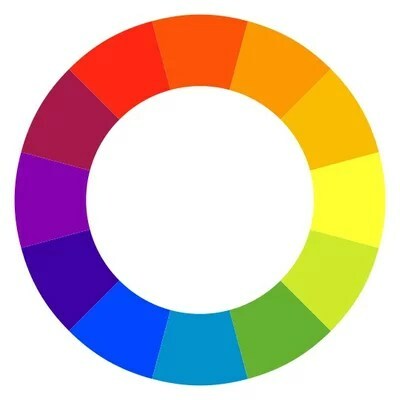 When using the color wheel as a guide, a basic rule of thumb is that using analogous (or adjacent) colors on the wheel will create less contrast and a more calm feel, while choosing complementary colors (across from one another on the wheel) will create greater contrast and a higher-energy room. Understanding the relationships between colors will help you see why certain combinations have certain effects on you. Color is all around us, and it affects everyone. You are rarely aware of the fact that you make decisions based on color everyday. Color’s effect on people has been studied by psychologists for years. The research shows that people share many common responses to color. For more on the power of color – check out our series here, here & here. For more tips and ideas for your home, visit us at sheelys.com or check us out on pinterest! This entry was posted in Color, Design, Design Tips, Home, Home Decor, interior design, Trends and tagged design, Home, Home Decorating Tips by sheelysfurniture. Bookmark the permalink. Great post👍, I did a post on wall colors a while ago, I would like you to check it out ☺.